Using Gaiman's list and checking it twice. I'm doing TONS of writing. None of it happens to be in the form of fiction, at least not on purpose. I'm writing blog posts, class notes for writers workshops, and too many sympathy notes. But I am writing and learning and feeling, so I'm going to give myself a partial pass on this one, which is generous, I know. Oh. There's a load of laundry piled on the bed and another in the dryer. Half of my perennial bed has been dead-headed. There's flaky, dried milk where we put the milk in the refrigerator. And I haven't gotten around to putting the smoke detector back up. But I did finish the ironing from two weeks ago. Pass? I did finish my dinner last night. I read a lot. I wish I could read more, faster. I would read more science fiction, I think. (I just finished Ender's Game.) I have been reading nonfiction that makes my soul itch, which makes me wish I were a better person, a smarter person. Definitely outside my comfort zone. I'm taking a humanitarian pass on that one. I feel bad enough already. I'm trying very hard not to be interested in certain things right now, like what's going on in Washington. Oi vey! Other than that, I'm hyper alert to life. My off button doesn't seem to be working, which I find disappointing. What I need is an ice cream cone and a tree swing. Let me try that and get back to you. Yes! I'm a daydreamer, and I don't get in trouble anymore. Pass and double-pass! I wrote this blog post. And finished it. That's two! How are you doing on your list today? I LIKE this list, very much. Maybe because it's the things I like to do...and I, too am getting better (kind of) at finishing things. I'm learning, at least, not to give up on them. Tonight I bought a book that was very much outside my comfort zone too. I can't wait to dive into it. It's funny, because my bedside table is full to overflowing with books that are smack bang within the boundaries of what I normally read, and I'm uninspired to read any of them. I think Mr. Gaiman is definitely right with what he says there. And I'll finish it. Phew. That'll make two things off the list. Gee life is fun sometimes! Not sure I totally agree with #4. You won't get much use out of things you don't enjoy. Not your favorite genres, that's different. But if what you're reading disturbs, angers, and otherwise unsettles you, how much good is it really doing? The rest, I agree with. No question. Megan: You'll have to let us know about that book. Sometimes an intriguing premise can tease us into trying something new. Forest: My response is misleading. I'm reading the nonfiction more as homework than pleasure. I think Mr. Gaiman is simply suggesting an adventure into a new-to-you genre. I read Ender's Game under the pressure of the new movie coming out. I'd wanted to read the story due to high recommendations from my husband and sons. It took not wanting to see the movie without first reading the book that made it happen. Great stuff, Patti! I pinned the pic! This wants to be printed off and laminated. Thanks, pal. Writing. And writing and writing. Oh, Nanowrimo. You are good at cracking that whip. Finish things? Writing projects, yes. Laundry/dishes/messy bedrooms? Well. Not so much. I'm totally interested in the chocolate hidden in my kids' halloween bags. Now back to writing. :) Or a shower. Hm. Great post. Hey writing is writing! I love to write but do not always write for posting to my blog or for others to read. I just write. Forest: I like your response. It's good to question things and to set our answers in such a way as they do not offend our souls. 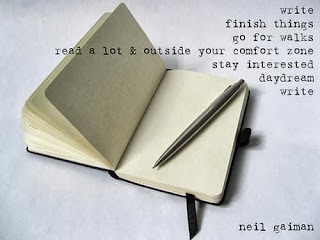 When I read Gaiman's list (and he seems to have produced a great many lists about writing), I cheered #4. Which is ridiculous because I largely read the books I love and ignore the ones that bore me. I gave myself full points on that, however, because I believe the books I read regularly are the best kind of books. I bet we all think that. And I bet we're all right. Thanks for your thoughtful comment, Forest. Tracy: Good to hear from you! I just finished Flames of Resistance. Yowza, girl! Loved it. On to the next Groot masterpiece, after I finish a story I've started a book club read. Susie: Ha! We gave away a huge bowl of chocolate to the bazillion trick-or-treaters who came by--polite and sweet, every one. We turned off the lights when there were two one-bite Snickers in the bowl. On for hunky hubby and one for me. Must replenish supply. Glenda: Yep, writing is writing. And such a privilege for those of us who have by blessing of birth and place to be able to do so. Bonnie: Thanks for expanding and adding your thoughtful reply to Forest. Walking: desperate, see you later. Not much writing this week. Lots of music and walking dog in snow laden forests. I did have the pleasure of meeting with my critique group this afternoon. Megan, they say hi! I am encouraged and inspired to etch out part of tomorrow to make some changes to my introductory paragraphs. I feel blessed. Hi Patti! I like that Gaiman's list begins and ends with writing. It implies that what we write after we've done all the other things might be different than what we wrote at the start, because the intervening activities change us and our perspectives. (Not that we do the items in order, of course.) I also like the list because it affirms that little daily stuff matters. And that writing is doubly part of that for us writers. Without my book club, I'd have trouble stretching my literary horizons, but they are great at that. And I love the confidence and momentum I feel when I've finished something. Wise words from Gaiman on that one, for sure. I need to do way more finishing.